Heat oil in a medium frying pan over moderately high heat. Add haloumi; cook for 1 minute each side or until golden. Transfer to a heatproof plate. Add asparagus to same pan; cook for 2 minutes or until golden. Transfer to plate with haloumi. Cut haloumi in half diagonally. 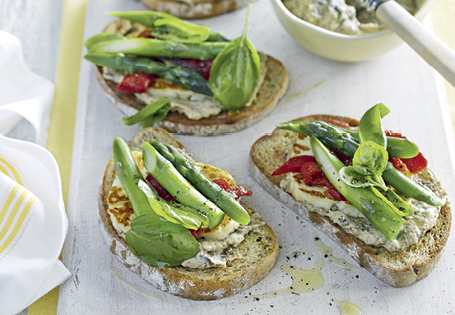 Spread eggplant dip over each slice of bread; top with haloumi, capsicum, asparagus and basil. Serve with lemon wedges. + DIY idea - Use drained canned asparagus in place of the fresh.